While I’ve rarely heard of this concern about Windows Vista, the sentiment actually applies across all versions of Windows. Windows versions go through various stages over time, referred to as the product lifecycle. From initial sales through end of sales through a couple of different stages of end of support, every version of Windows lives, and dies, through a fairly well-defined series of stages. Let’s look at each of the end-of-life stages individually. leo notenboom ask leo, leo notenboom, microsoft windows, Windows. permalink. when will windows 8 be out? I see no need of throwing away XP PRO. I have worked on other peoples computers with other operating systems. Some of these operating systems have some nice features, but a pain to re-learn. My problems is you have to reload all of your outdated programs that you LOVE and can't find the product codes for. My self I have almost a million files in my computer. My home built computer is top of the line and fast. I agree with you. I have a horse and see no reason to upgrade to a car. I am not going to give up all the things I have like my saddle and horse blankets and all sorts of elaborate tack. All my files are in my saddle bags and I see no reason to put them in the trunk of a car. This moving on and keeping up with all the great new innovations is not for me. Oh yes, I however was not smart enough to build my horse. I wouldn't change xp for anything else. I’m hoping Vista dies out, all of my friends who owned it, dumped it and went back to XP or moved onto a newer OS. I on the other hand miss 98SE and 2000. I’ve had XP only for a few years when the mother board died out and was forced to move onto Win 7 which seems good for now (I miss the TRS 80 I learn’ed on lol) showing my age here. 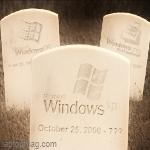 I hope that I can keep running XP until my hardware dies. I was happy with 98SE until I was forced to use XP on my newest computer. Question concerning Windows various “updates”: I have Windows Vista Home Premium and Internet Explorer 9, 32 bit. No problems with this setup. After Microsoft updates whatever they’re going to update, will my setup still be OK?